The congregation began services in 1937, and formally organized in 1938. The first services were held in the Bertdale Hall, north-west of town. In 1940 twenty-two persons were baptized and added to the church. The first building was occupied in 1945, with a subsequent building program in 1992/93. Nick Janz is considered the founding leader of the group. The congregation originated through immigration from the Soviet Union. Ministers in the early years include Nick Janz, David Thiessen, Henry Regehr, Peter Penner, and George Petkau. During the 1960s the General Conference Mennonite Church closed and its members joined the Mennonite Brethren Church. The group became known as Gospel Fellowship Church in 1979. It was first known as the Foam Lake Mennonite Brethren Church. Mennonite Brethren Herald (27 May 1988): 67; (16 September 1988): 22; (5 February 1993): 21; (6 August 1993): 21; (4 February 2005): http://www.mbherald.com/44/02/transitions.en.html (accessed 18 April 2010); (July 2009): http://www.mbconf.ca/home/products_and_services/resources/publications/mb_herald/mb_herald_july_2009/people_and_events/transitions/; (May 2014): 38. Penner, Peter. No Longer at Arm's Length: Mennonite Brethren Church Planting in Canada. Winnipeg, MB: Kindred Press, 1975: 126-127. Available in full electronic text at: https://archive.org/stream/NoLongerAtArmsLengthMBChurchPlantingInCanadaOCRopt?ref=ol#mode/2up. Gospel Fellowship Church collection at Centre for Mennonite Brethren Studies. Address: Box 758, Highway 310 North, Foam Lake, SK, S0A 1A0; located at McIntosh St. and Robertsen Avenue. Epp, Marlene. 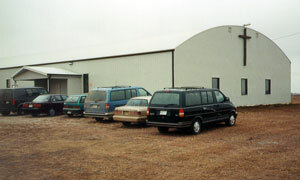 "Gospel Fellowship Church (Foam Lake, Saskatchewan, Canada)." Global Anabaptist Mennonite Encyclopedia Online. May 2013. Web. 19 Apr 2019. http://gameo.org/index.php?title=Gospel_Fellowship_Church_(Foam_Lake,_Saskatchewan,_Canada)&oldid=163619. Epp, Marlene. (May 2013). Gospel Fellowship Church (Foam Lake, Saskatchewan, Canada). Global Anabaptist Mennonite Encyclopedia Online. Retrieved 19 April 2019, from http://gameo.org/index.php?title=Gospel_Fellowship_Church_(Foam_Lake,_Saskatchewan,_Canada)&oldid=163619.